Many bands, one Primordial. Going on nine records deep into a career that in 2018 hits 25 years since the release of their first demo, the Dublin-based metallers are one of a kind. Over their time, they’ve transcended black metal, pagan metal, Celtic metal, doom and however many other subgenres on their way to defining and refining their sound, and with the forthcoming Exile Amongst the Ruins — out March 30 on Metal Blade — the five-piece will once again showcase the individualized take and particular dramatic bent that makes them who they are: not only distinct sonically, but one of heavy metal’s most affecting bands, capable of stirring the soul in a way few groups can. for “Stolen Years,” which is the first track to be unveiled from Exile Amongst the Ruins. We see the band, led as ever by frontman Alan “Nemtheanga” Averill, essentially preparing for a show. The rest of the group — founding guitarist Ciáran MacUiliam and bassist Pól MacAmlaigh, guitarist Micheál O’Floinn and drummer Simon O’Laoghaire — laughs and drinks and checks gear as Averill ritualistically dons the stage makeup he’ll wear during the set. Shot in black and white and slow motion, the spirit of the clip portrays a sense of import, of meaning, to what becomes to the band and to fans clearly more than just another night at a gig. And as for the song itself, “Stolen Years” is something of a surprise. When one thinks of “lead single,” it’s hardly the kind of fare imagined. With a subdued melancholy and a structure that pulls away from the hooks the band often proffers, it feels more meditative than a lot of what Primordial does, but it’s still undeniably theirs. As it appears late in the tracklisting for Exile Amongst the Ruins, which you can see in the album announcement that follows the video here, it leads one to wonder what sort of atmospheres Primordial might dig into as side B of their latest offering plays through. For the time being, I can only look forward to finding out. 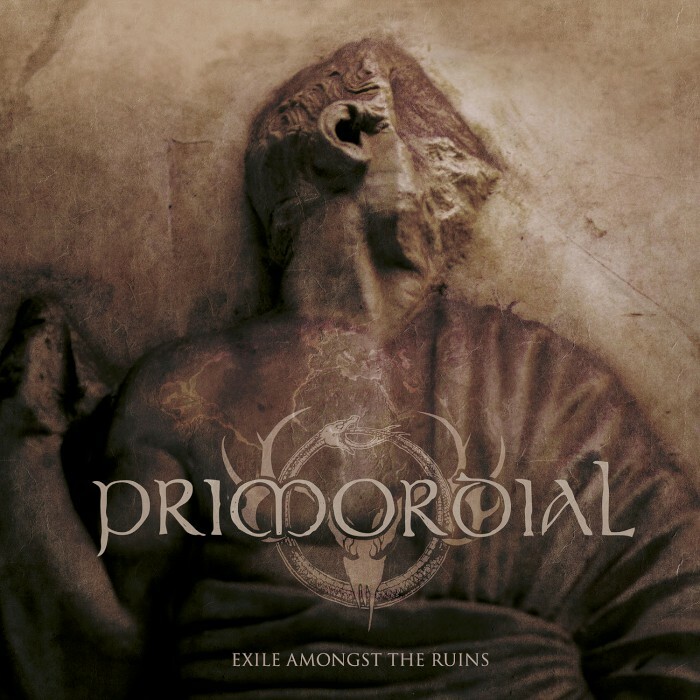 Irish pagan metal gods PRIMORDIAL announces their new album Exile Amongst The Ruins for a March 30th release through Metal Blade Records. The band teamed with producer Ola Ersfjord, who worked on their 2016 live album Gods to the Godless. 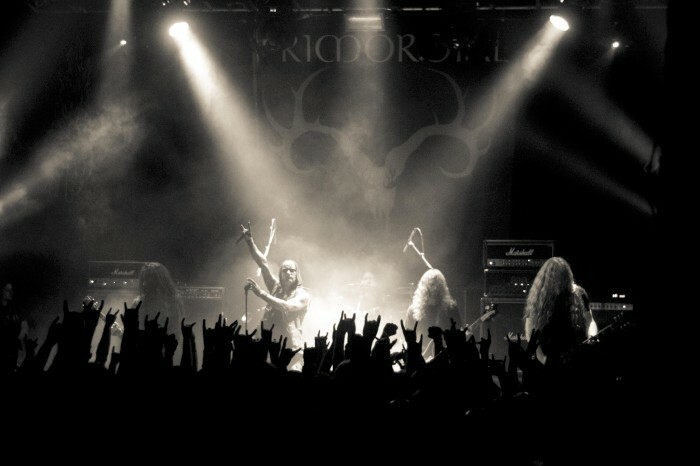 The record was tracked at Dublin’s Camelot Studios, located adjacent to PRIMORDIAL’s rehearsal room. To coincide with the album release the Irishmen have just announced two special and rather intimate album-release shows in Germany as well as their appearance on the Heathen Crusade European tour with Finnish MOONSORROW as co-headliners and German DER WEG EINER FREIHEIT as support act! 14/07/18 DE Balingen Bang Your Head!!! This entry was posted	on Monday, January 22nd, 2018 at 10:05 am	and is filed under Bootleg Theater. You can follow any responses to this entry through the RSS 2.0 feed. You can leave a response, or trackback from your own site.